Steam can be fun! The Great Go-Kart Race by Litton – Joyce's mystery and fiction book reviews with some non-fiction too! 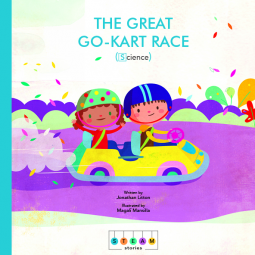 The Great Go-Kart Race is a story in a new series of picture books that feature STEAM concepts. Each entry will highlight Science, Technology, Engineering, Art or Math. This one is about science. The book has lovely, appealing illustrations. We watch as the young protagonists. Max and Suzy try to win their go-kart race while encountering some obstacles along the way. For example, they get stuck in the mud. How will Max and Suzy manage their challenges? They succeed by using what they know and observe. Young listeners will get an easy to understand yet genuine exposure to some scientific principles as try to figure out what will happen next. Concepts covered include forces, energy and materials. The back of the book has questions and additional resources. This looks like it will be a great way to introduce concepts to children. I look forward to reading more in the series.